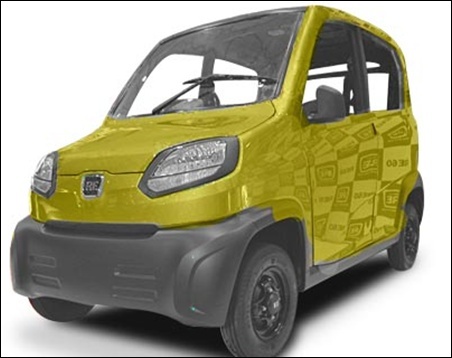 Bajaj Auto Ltd on Friday said it plans to roll out 5,000 units of its much-delayed four-seater "quadricycle" codenamed RE-60 from its Aurangabad plant. government, commercial production would happen only after a government-appointed committee, set up to define the category of this vehicle, submits its report. The company claims that the vehicle's 216-litre petrol will deliver a mileage of 35 km per litre, with lowest emissions. Unveiling the four-seater RE60, Bajaj said the company will roll out the "revolutionary four-wheeler RE60" from its Aurangabad plant, where it used to manufacture its once iconic scooters. However, he refused to divulge a tentative price tag or the investment in developing the vehicle. "Pricing will be decided only after regulations are in place," he said. Explaining the reason for the committee report, Bajaj Auto's President, Commercial Vehicles, R C Maheshwari, said, "The government has given us an in-principle approval to create this new class of four-wheelers or quadricycles". "A committee is working on regulations and norms for such vehicles. We understand that the process for the final inclusion of this new class in the commercial vehicles segment will take a few months more," he said. He also pointed out that such vehicles have already been classified in Europe, USA, Canada, Japan and other parts of Asia and suggested that the government follow similar classification and standards. However, Bajaj did not offer any time frame by when the committee is likely to submit its report, and hence could not offer any tentative date for commercial production. "We will be ready to begin commercial production as soon approvals are in, hopefully this fiscal itself," he said. He said that if approval took too much time to come, he would not mind launching the product outside the country and cited SAARC region and Latin America as alternate launch pads. "In terms of exports, the vehicle would be relevant to all markets to which we export our three wheelers. So markets in Asia such as Sri Lanka, Bangladesh, besides African markets like Nigeria, Tanzania, Kenya and Uganda, as well as Latin American markets like Columbia and Mexico are promising," he said. He said his company would prefer to go with its partners Renault and Nissan, to take the vehicle to Europe, hinting that an alliance with the French car major is yet to be called off. He said that the RE60 is designed to be different from other vehicles, and the objective is to offer an improved vehicle for intra-city transport. Applying to the London Business School? Read this first!